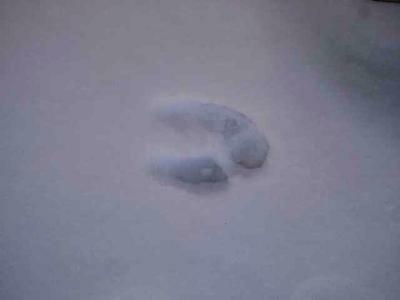 Woke up this morning to these tracks all over our backyard. We live in the city, our house was built in 1957. I find it hard to believe that the tracks would belong to a deer, it would be very far from its home! Any ideas? Yes, that looks like a deer track! They do live in hedgerows along highways. Join in and write your own page! It's easy to do. How? Simply click here to return to Animal Tracks.